Avid audiobook listeners will be excited to know that Sonos has just added support for Audible to its line of smart speakers. 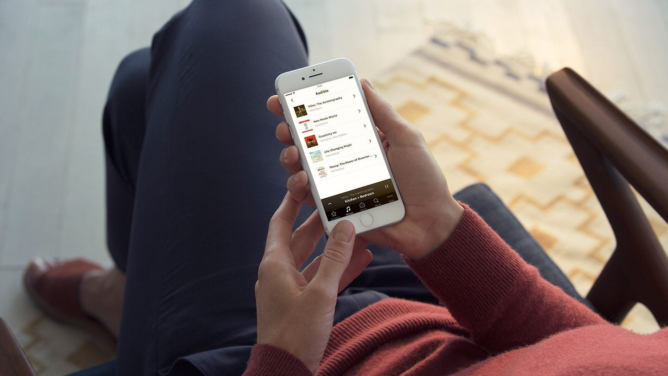 Despite having already worked with Amazon to equip its Sonos One speakers with Alexa, Amazon's Audible audiobook service was still surprisingly missing from the list of available music services in the Sonos app after having been removed two years ago. As a way of enticing people to sign up, Audible is also offering users 2 free credits with a 30 day trial. Usually, Audible trials only come with a single credit, so this is twice as good as their average promotion. Not only that, but Audible is also throwing in a free copy of Miles Davis' autobiography (of Kinda Blue fame) in addition to both books — so that's essentially 3 free audiobooks for free. I managed to sign up for the trial, but for some reason, the autobiography was not added automatically to my account. I suspect this might have had something to do with an issue with my billing address, but after a 1-hour support chat with Audible, I eventually got the audiobook to show up in my library. Another thing to note is that there wasn't any verification that I actually owned a Sonos system at all, which seems to imply that the promotion is available for any user at all, even though the Audible page mentions that the deal is exclusively for Sonos owners. Currently, the link to the Sonos blog post returns a 404 error, so we've copied it in full here. The link for the trial promotion is still working though, so be sure to sign up while you can. With Audible on your home sound system, you can easily make books an everyday source of enjoyment for yourself and the whole family. Become a master multitasker and listen to audiobooks while you cook, do laundry, take a bath or work out. Start a story while the kids get into their pajamas and brush their teeth, so they’re already sleepy by the time they climb into bed. 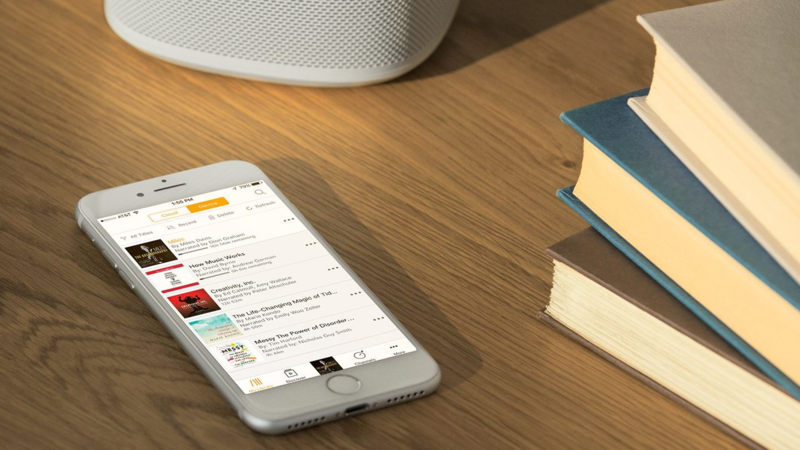 Audible has the world’s largest selection of audiobooks, but if you don’t know where to start, check out some of our favorite reads/listens below. In this work of nonfiction, Talking Heads lead singer and guitarist David Byrne looks at music through various lenses—history, anthropology, psychology—but mostly through the prism of his personal experience, and it’s clear that despite decades in the music industry, his enthusiasm for the subject remains unjaded. Byrne’s lack of formal music education combined with his conversational tone makes this book enjoyable for everyone from casual music fans to critics. Marie Kondo’s trademark KonMari Method will help you transform your home. Her book, which has sold over eight million copies worldwide, outlines how to reassess the things that occupy your space so that it becomes a source of inspiration rather than frustration. It’s a great listen for when you’re taking care of daily household tasks. Miles Davis lays everything out in this autobiography: his childhood, racism, drug addiction, friendships, women and of course, the music. The self-portrait Davis paints in his book is frequently unlikeable yet undeniably fascinating. Actor Dion Graham’s raspy and magnetic narration will make you forget it’s not actually Davis’s own voice, making it easy to lose yourself in the story. If you’re a manager, this book by Ed Catmull, a co-founder of Pixar Animation Studios, should make your list of must reads. Drawing on his own experience, Catmull offers advice on establishing a workplace culture that fosters creativity and innovation. These insights will appeal to people at all levels of the workforce, but this isn’t just another business book, as Catmull offers an entertaining behind-the-scenes glimpse at the force behind some of the greatest films of the last two decades. If Marie Kondo’s The Life-Changing Magic of Tidying Up doesn’t speak to you, perhaps Tim Harford’s Messy will. Harford looks at messiness. Harford does not aggrandize untidiness or suggest it’s something to aspire to, but he does point out the pitfalls of rigidity and makes a convincing argument to embrace the messiness in life and their ability to force us out of our comfort zones and routines. For a limited time, new subscribers get two free credits and Miles: The Autobiography of Miles Davis pre-loaded when they sign up for a 30-day trial through the Sonos app. Try it today. After having taken down the blog page, Sonos has backtracked on Audible compatibility. According to a statement given by a Sonos spokesperson to Android Police, Sonos is "actively working to bring Audible to Sonos, but this feature is not yet available. This blog post was published erroneously." Unfortunately, the trial page has also been taken down and now simply leads to Audible's homepage, but if you were lucky enough to take advantage of the promotion, the credits should still be in your account and you should still have a "Sonos Offer" membership status. Despite not being live and there being no official ETA for Audible support in Sonos, it's clear that the feature should be ready to go live very soon. It looks like Sonos has finally rolled out Audible support after jumping the gun a couple of weeks back. The blog post and trial page are now live, so you should be able to take advantage of the promotion if you weren't able to previously. 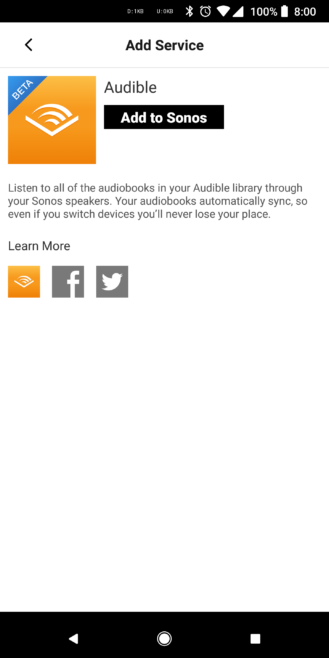 Again, this promotion is much better than the regular trial Audible offers, since users can get 3 free audiobooks (one of which is Miles Davis' autobiography) instead of the usual 1 audiobook. The promotion is supposed to be exclusive for Sonos owners, though last time I was able to enroll in the trial without having to verify that I actually owned a Sonos speaker.